The La Quinta Resort & Club began its legacy in December 1926, when it was built at the foot of the serene, yet rugged, Santa Rosa Mountains. In 2014, the Resort underwent a multi-million-dollar revival. The restoration retained the allure and architectural authenticity that make this property a one of a kind retreat for all. 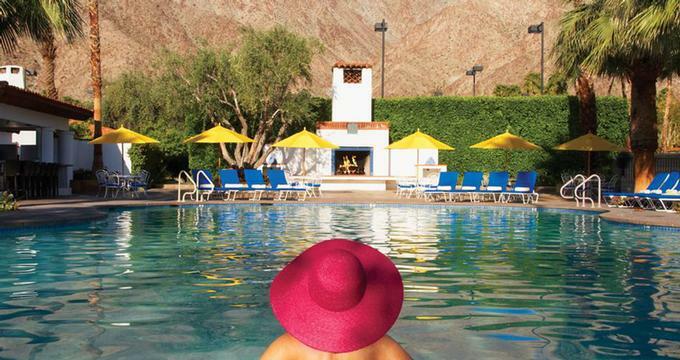 La Quinta, which has long known to be a sanctuary from the glare of publicity for the Hollywood elite and other celebrities, is also a beloved refuge for city dwellers looking for a place to unplug and unwind. 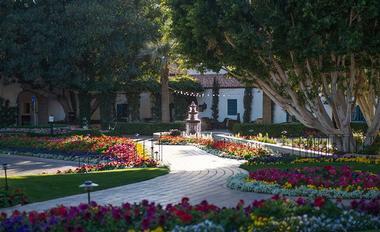 It is easy to escape your worries at the La Quinta Resort & Club, California’s oldest premier desert retreat. The resort is also a renowned haven for culinary aficionados and sports inclined travelers, alike. 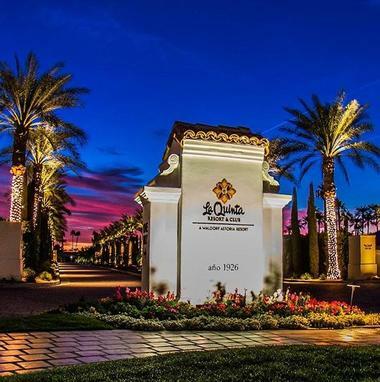 La Quinta Resort & Club started with 20 casitas and has grown significantly to include 620 guest rooms and 98 villas (one-, two- and three- bedrooms), each with private patios. However, the welcoming and secluded environment has remained through the years. The guestrooms average 462 square feet in size and are clustered around the sparkling pools. Several of the spa villa studios can be configured into three bedroom suites to accommodate larger groups. Many of the traditional suites feature a hospitality kitchen, dual wood burning fireplace, and conference table for up to 14 guests. Eight of the suites highlight private spas; five luxury suites come equipped with a private pool and spa. Standard conveniences are found in every casita, suite, and villa, including in room Keurig coffee makers, irons, hairdryers; in-room safes (most rooms), oversized bathtubs, separate showers, double sink vanities, and lighted make-up mirrors. 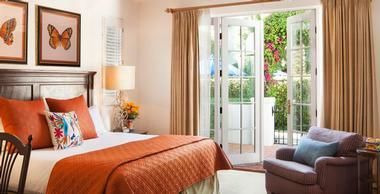 The La Quinta Resort is pet-friendly. The Resort charges a flat fee of $100 per pet, per stay for the pet guest. All guests traveling with pets will receive an amenity package including: an oversized pet bed, stainless steel bowls with a placemat, a dog bone, helpful tips for vacationing with pets, and a resort map highlighted with designated dog relief stations. Guests may opt make a donation to the Society for the Prevention of Cruelty to Animals. If you want to relax in presidential style, reserve the Eisenhower Suite. President Eisenhower frequently stayed in this 1,600 square foot historic getaway. This suite offers seclusion with a separate elegant master bedroom which includes a fireplace and oversized bath, and additional half bathroom, and the private Eisenhower pool which is located just a short walk from the front door. The Arzner Suite, named after Dorothy Arzner, noted as the first sought after female film director in Hollywood, is another famous hideaway for those who wish to relax in style. This spacious suite has been updated with modern amenities and boasts two bedrooms (king beds in each), two bathrooms, a living room with high ceiling and a fireplace, a separate dining room and art deco style elements throughout. This suite also has an oversized patio with yard and amazing mountain views for alfresco entertaining. The exquisite Hacienda Grande features its own carport and secluded yard with a private pool and an outdoor hot tub. This 2,000 square foot retreat features details such as Saltillo tile, wood beam ceilings, and wrought iron chandeliers, all of which make this a unique architectural space. It contains one bedroom, a bath and a half, and French doors enhancing just about every room. On cool nights, this suite warms you up with three separate fireplaces throughout. The renovation was inspired by the colorful desert surroundings and is in a re-imagined early California style, highlighting custom tile work and wrought iron components. The whitewashed Spanish-style casitas and suites are nestled in a contemporary palette of chocolate, ivory, and terracotta offset with citrus overtones. The fresh look of two-toned drapery panels and floor coverings add to this and compliment the modern furniture. Guest bathrooms are enhanced with blue-sky accessories and upgraded lighting. Patios in Starlight Casitas showcase mountain views in the background while offering new fire features for entertaining outdoors in style. 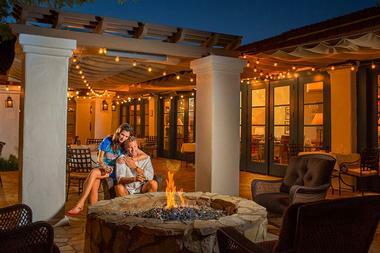 Guests may choose from several different on-site dining options at La Quinta Resort and Club, inclusing Morgan’s in the Desert, Twenty6, Adobe Grill, Ernie’s Bar and Grill, and MD Grill. Morgan’s in the Desert, courtesy of chef and restauranteur Jimmy Schmidt, is reminiscent of the ambience of the original 1926 establishment. As La Quinta’s signature dining establishment, Morgan’s specializes in modern American cuisine infused with the bounty of the local Coachella Valley. The result is maximum flavor from traditional cooking methods (braising, open grilling, slow roasting, pickling and curing) using farm to table sustainability practices. Responsibly grown, local ingredients create an exquisite culinary experience that any foodie would love. Twenty6 is a bistro style modern American grill with a reminder of classic taste. Updated spins on classic dishes feature seasonal, local ingredients. With an Art Deco flair, this all day venue has a fun and welcoming atmosphere for all guests. The Adobe Grill, which is famous for serving refined, authentic Mexican cuisine, features colorful décor and Mariachi music. This amazing venue is decorated with vibrant wood carved folk art, rustic accents from the old world and a 10-foot-tall Aztec pyramid. The grill features 100 different varieties of tequila which serve as the base for hand-crafted signature margaritas by the “Master Tequilero.” Guest favorites include award-winning tamales, hand-made tortillas, table side guacamole and Caesar salad. Guests can relax here while listening to live music on the open air plaza in the heart of the Resort. Bar Twenty6 is a great spot for California wines by the glass, signature cocktails, and draft beer. It serves as the optimal spot where visitors and locals alike can grab a small bite to eat. The MD Grill is located at the Mountain and Dunes Clubhouse, and features excellent classic American dishes. From Angus burgers to club sandwiches, this is the best place for those who crave burgers to be. The MD Grill, conveniently situated near the 9th and 18th green, is in the ideal location to begin or end your golf game on the La Quinta Resort Mountain Course. 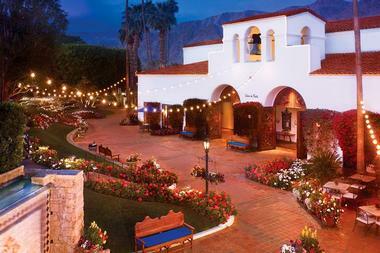 The La Quinta Resort & Club has a 23,000 square foot spa venue housed in Spanish Colonial architecture. The spa is equipped with 38 treatment rooms, including indoor and outdoor massage, facial and wet treatment rooms. For a peaceful and serene place to relax before or after a treatment, the Sanctuary Courtyard is centrally located and highlighted by an outdoor wading fountain, a cooling mist system and a fireplace. The progressive spa also contains men’s and women’s treatment wings steam rooms, inhalation rooms, and private whirlpool baths. They also offer a full-service salon, ideal for superb quality hair and beauty treatments. Featured treatments include the signature HydraFacial, customized Junior Spa services for children and young adults, and a bevy of spa packages offering a mixture of therapeutic treatments. Spa La Quinta was the recipient of two impressive 2013 Spafinder Wellness 365™ Readers' Choice Category Awards; one for Best Urban Hotel Spa and the other for Best Hotel Spa for LGBT. Spa La Quinta offers a highly luxurient Pet Pampering Service. Bring you adored pet companion to experience this unique desert oasis and treat them to a pampering session at the spa, which also received the 2013 Spafinder Wellness 365™ Readers' Choice Category Award for Best Pet-Friendly Spa. The neighboring 4,000 square foot fitness center and fitness studio is equipped with top-quality Precor exercise equipment. La Quinta Resort guests have several golf courses to choose from. The property is equipped with five resort courses, and located near four private ones – including the top-rated TPC Stadium Golf® Course at PGA WEST, the Jack Nicklaus Tournament Course at PGA WEST, the Pete Dye designed La Quinta Resort MountainTM and Pete Dye DunesTM courses and the Greg Norman Course. The Resort also contains a golf academy for those who wish to improve their game. PGA West Golf Academy is designed to offer instruction to players at any skill level. The academy provides Students an optimal learning experience with results designed to last a lifetime. While at the Resort, guests may use the high-quality tennis venue ran by USPTA-certified staff which includes 18 hard courts (with 10 well-lit for night games), 5 Har-Tru clay courts, Tennis and Fitness Pro Shop and the Centre Court Cafe. Tennis Magazine has La Quinta ranked among it’s “Top 20 Tennis Resorts” on a consistent basis. 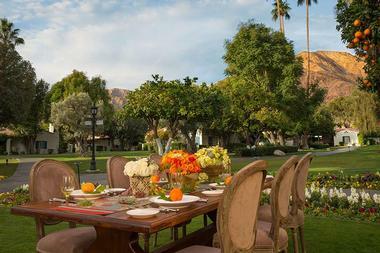 The La Quinta Resort and Club is perfect for accommodating intimate weddings or large conventions. The resort is equipped with over 190,000 square feet of indoor and outdoor facilities, as well as beautifully maintained grounds and garden areas that are exceptional for receptions, events, alfresco weddings, and conference break-out sessions. The Plaza features retailers such as: Audrey’s + Greta’s, The Bungalow Shop, the Marketplace Gift Shop, a Polo Ralph Lauren store, the PGA WEST Store, Tumbleweeds and Lollipops. 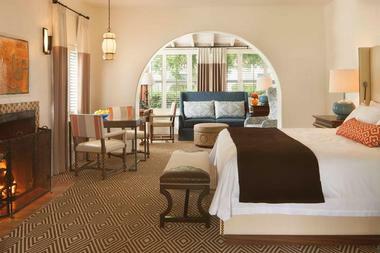 La Quinta Resort & Club has baby-sitting services available, as well as cribs and high chairs for use. Children’s menus are also available at the dining establishments. Another perk for the kids is the Junior Spa services at Spa La Quinta. There are ample prospects for adventure in the surrounding areas. These include bicycle rentals and tours, jeep tours, horseback riding and hot air ballooning. Nearby Palm Springs offers many popular attractions, such as the Palm Springs Aerial Tramway, which climbs to the top of Mt. San Jacinto; the Palm Desert Living Desert Museum; Joshua Tree National Park; Indian Canyon Hiking Trials; Knott’s Soak City Water Park; McCallum Theatre; Eldorado Polo Club; Old Town La Quinta; and the stylish El Paseo Shopping Area which is recognized as the Rodeo Drive of the desert. Back to: Best Things to Do in Palm Springs and Romantic Weekend Getaways from Los Angeles.